Okay, so I might not actually be a local, but I have been to Clearwater beach like, WAY too many times. Clearwater is like a second home to me because it’s where my one and only sister, Brie, lives. We visit Brie a few times a year and have done everything there is to do (twice). It is an adorable town with miles of white sand beach and tourists as far as the eye can see! For this itinerary you will definitely need a rental car! 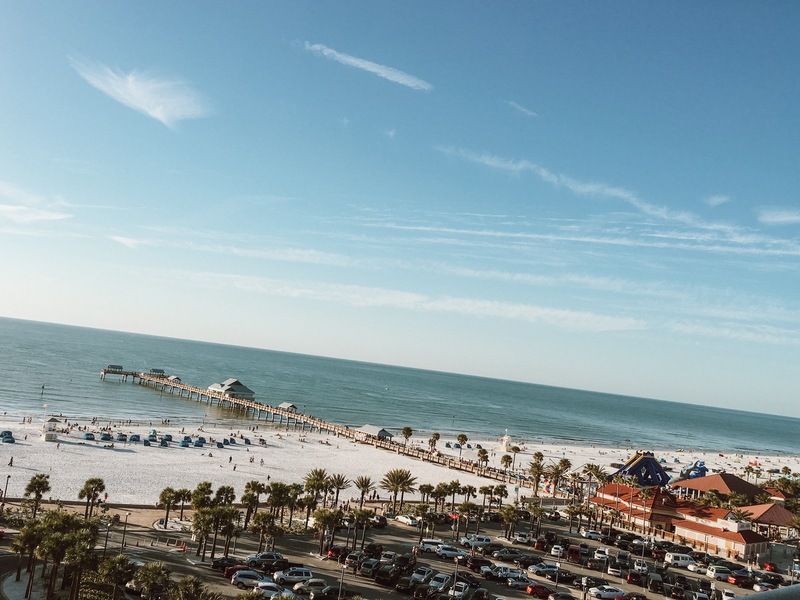 There are so many fun things to do right outside of Clearwater, which makes it the perfect hub to stay at. I recommend staying on the inner coastal side of Clearwater Beach. Every time we have stayed there we’ve gotten to see wild dolphins! You are also such a quick walk or bike ride to all the popular restaurants + the sunsets are hard to beat. I believe winter is the best time to go because it is far less crowded, minimal humidity, still beautiful 70-80 degree weather, and so many wild animals are in the canals and rivers! The only downside is the ocean water can get pretty cold in the winter, so if you are coming to town to spend a lot of time on the beach, spring might be better for you! If you are traveling to Clearwater in the winter months, I would still bring summer clothes + a few light jackets. It gets cool at night, but still sunny and warm during the daytime! Day 1: Fly into Tampa, FL! Tampa is the closest airport to Clearwater Beach – only 30 to 40 minutes away. If you’re flying anywhere from the west coast (like me) you will lose almost a whole day with travel + time change. Grab a yummy bite to eat & explore all the fun bars and shops along Mandalay Blvd! Kick off your vacation and possible jet lag with a relaxing beach day. There are sooo many beautiful beaches in/near Clearwater including the award-winning Clearwater Beach! This perfectly groomed, white sand beach is like something out of a movie. The gulf water temperatures range anywhere from 80-90 degrees in the summer time, making this the most crowded beach in all of Clearwater. Honeymoon island is about a 30 minute drive from Clearwater beach & far less touristy. You will have to pay a small entrance & parking fee but it’s a price worth paying to actually have room to lay out on the sand! Plus the name of this beach is too cute to skip out on! Sand Key beach is also far less crowded than Clearwater Beach and still so close – Only a 10 minute drive away! This beach is not groomed and has many sea shells on it. If you are looking for the fluffy white sand, then I would stick to Clearwater beach. Caladesi Island is near honeymoon island and can actually be accessed by kayak. If you wanted to skip the kayaking and go right to Caladesi, you will have to pay for the boat to take you + a state park fee. The beach is beautiful and there is a 3.5 mile trail around the island to show you the mangrove swamp, sand dunes, coastal scrub, & more! Seeing Clearwater Marine Aquarium is an absolute must see if you are in Clearwater. I might be a tad biased because my sister is a dolphin trainer there, but it’s home to the famous Winter the dolphin! Have you ever seen the movie Dolphin Tale? If not, its an inspirational movie series about a dolphin who lost it’s tale in a crab trap. Winter has surpassed all expectations and still lives thanks to the amazing and talented CMA team (especially Brie)! People with disabilities, veterans, and other amputees fly in from all over the world to see this rarity. The aquarium currently has dolphins, pelicans, otters, turtles, nurse sharks, & sting rays! Thanks to their two successful movies, they are constantly growing to help more animals. I would end your busy day at the aquarium with lunch at my all-time favorite restaurant, Bait House. Bait house doubles as a restaurant and fish shop! They have a spot where fisherman can pull their boat right up to the restaurant – they will even prep & cook the fish you just caught! TIP: Don’t forget to bring a dollar to write your name on and staple to the walls – on your next trip you can see if it made it through the hurricanes, ha! Dunedin is a picturesque town just 15 minutes outside of Clearwater Beach. It has town-wide festivals, storefront shops, and water bowls for dogs in front of every store! If you like beer, this is a great spot to hang out where the locals are and take a flight of some Florida beer. Some of the best breweries in the area are Dunedin Brewery, Woodwright Brewery, and 7th Sun Brewery. Orlando has endless amusement parks but is a two-hour trek EACH WAY from Clearwater beach. A great alternative is Busch Gardens in Tampa, which is only a 45 minute drive away. You’ll get a good mix of animals and roller coasters without having to spend too much of your vacation driving! End your night with live music and a famous Clearwater Beach sunset at the Palm Pavilion. If you walk along the marina, you will see endless tours for sale! You can go jet skiing in the marina, parasailing in the ocean, rent a boat and go fishing and so much more. I’ve never done the parasailing because I get too sea sick, so if you do it, let me know in the comments below so I can be eternally envious of you! End your night with a cocktail and corn hole at the cliff-side bar, Sand Bar. Day 7: Beach day & Fly Home! Sleep in and get a nice farewell breakfast on the beach! This truly is a perfect itinerary! And I definitely think you get local street cred for how well you know this town. I honestly feel like if I were going to clearwater beach this would be the literal only blog post I would need to read- which is incredible, because I am usually an obsessive researcher. I can’t believe how much travel you have already done at 22 years old. It definitely seems like you have a knack for planning out great vacations. Keep up the awesome work. Excited to follow along.